Super Sons (2019) Average 4.00/5 - out of 1 total votes. The polar ice caps have nearly melted away, causing devastation to coastal cities. Erratic, deadly weather forces everyone inland, tearing families apart. Earth is facing its greatest crisis—and Superman and Batman are nowhere to be found. Jon Kent and Damian Wayne are opposite in every way except one—they are the sons of the World’s Greatest Heroes! To uncover a global conspiracy, this unlikely dynamic duo will need to learn to trust each other and work together to save the Earth. But who is the mysterious Candace? And what secrets does she hold that could be the key to everything? 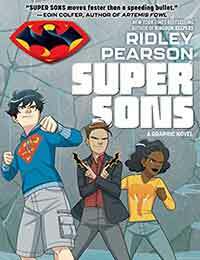 From New York Times bestselling author Ridley Pearson (Kingdom Keepers) and artist Ile Gonzalez comes the first original graphic novel in an epic three-part series that follows the Super Sons of Superman and Batman as they struggle to find their place in a rapidly changing world!